It’s been too long since my last blog update….my apologies. As far as New Year’s goals go, I am pleased to say I have/am accomplishing them. I am employed, eating more healthily, and am constantly pursuing the “love more” goal. More than any other summer, this summer has flown by! It doesn’t even feel like summer, really. The temperatures are hitting record lows, and I have no Spring or Summer semesters in school to mark the beginning or ending of Summer break. It’s all been rather strange. I did have wonderful visits with my parents and parents-in-law in June. It was so nice to have family around. The family and I went whale watching out of Dana Point Harbor. 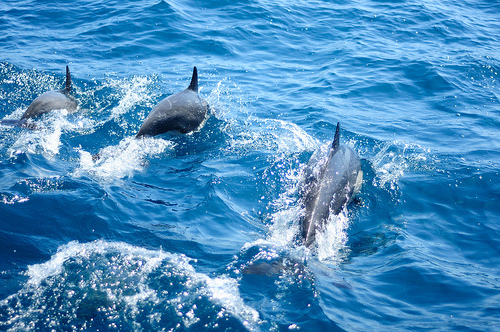 While no whales were seen on our voyages, the dolphins were out in full force! There were hundreds of the beautiful, graceful, streamlined animals darting through the waves and jumping out of the water. The dolphins are actually much more interesting to watch than the slower, larger whales which were M.I.A. Since starting work at my current job in March, I have found my scrapbooking and photography have really been neglected. Thus, I have a new goal of learning better time management so that I may resume those hobbies. I would love to have some visitors between now and Christmas, so if any of you friends and family would like to come out to the West Coast…let me know!